A potential fractions task because because middle schoolers probably really struggle with the high cost of shaving blades. Not a super complex task, but maybe good for a warm-up? Dollar shave club sells razors at a price of four for $6. 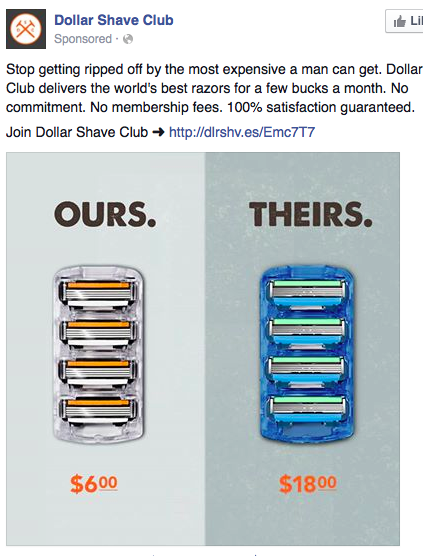 “Their” razors cost 1 1/2 for $6. How much do both companies’ blades cost per blade? How much do “theirs” cost for a pack of four? Where did Dollar Shave Co. get these prices for “theirs”? One of the things I like about this is that you potentially have a fraction within a fraction. 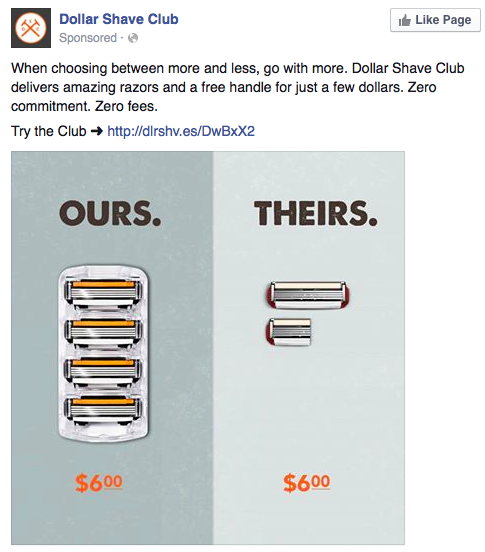 That is, one can calculate the cost of “their” razors by dividing $6 by 1 1/2 razor blades. Also – and I don’t say this often – please don’t make this a hands-on activity. Previous Entry:Assessment via audibles: OMAHA! OMAHA! Out there in the real world I don’t think anybody would consider dividing 6 by 1 1/2. 1 1/2 for $6 says 3 for $12, which says 1 for $4, and in the process the “turn it upside down and multiply” rule is validated. Hmm.. Well. I live in the real world and that’s what I did initially to find out the cost per blade. But kudos if you have a different approach. Isn’t that the whole point? (I think) I might (respectfully) disagree with that. It seems like people are more likely to work with the numbers that are presented to them, as opposed to using proportional reasoning to create numbers that don’t appear in front of them. In this case the number 1 1/2 razor blades and the number 6 dollars are the numbers they see. While dividing 6 by 1.5 perhaps isn’t something a lot of people do mentally, with all of the iStuff and androids traveling with folks, that is a fairly simple button-pushing task. It might seem more tempting that reasoning with multiple packs of more expensive razor blades. I also wonder “what’s a blade?” I count four times four on the left and one and a half times four on the right. This would make 16 / 6 vs. 6 / 1.5. I think that this kind of proportional reasoning, which is very practical to the point of ubiquity, can be taught as a reflex. See a mixed number, multiply all factors by the denominator, solve, check for reasonableness, repeat. We have a middle-school game on http://www.mathnook.com that trains just this kind of approach, so that once the math is understood, the mechanics become automatic.